Egypt’s headline inflation continued to climb year-on-year in October, rising to 17.7 percent from 16 percent in September, official statistics agency CAPMAS said on Saturday. The rise in annual urban consumer price inflation was greater than expected and increases the chance that the central bank could raise interest rates next week, analysts said. Egypt has hiked fuel, electricity and transport prices over the past few months to help meet the terms of a $12 billion International Monetary Fund loan programme it signed in late 2016 that includes deep cuts to energy subsidies and tax hikes. On a monthly basis, inflation accelerated to 2.6 percent from 2.5 percent in September. Food and beverage inflation eased to 3.5 percent in October compared to 4.8 percent the previous month. “The numbers are much higher than expected ... the price of fruit and vegetables are the main cause,” said Radwa El-Swaify, head of research at Pharos. “Interest rates were expected to be held steady at the central bank meeting next Thursday, but after the unexpected rise we cannot rule out an interest rate increase between 1 and 2 percent,” Swaify said. Egypt also floated its pound currency in November 2016, with inflation hitting a high of 33 percent in July last year before falling back. After easing to 13.5 percent in July, annual inflation has risen for the past three months. 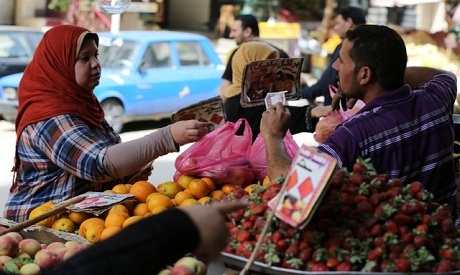 Tens of millions of people in Egypt, the Arab world’s most populous country, are struggling to meet basic needs after successive increases in the prices of vegetables, fruit, fuel, and medicine. The price of potatoes rose sharply in recent weeks, prompting the state to intervene to ensure supply.